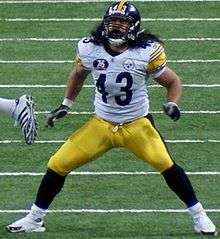 Troy Polamalu was the highest picked safety in the draft and won two Super Bowls including multiple Pro Bowl and All-Pro selections with the Pittsburgh Steelers. 1 2 3 4 5 6 7 8 9 Hack, Damon (April 27, 2003). "N.F.L. Draft Starts on Offense, Then Shifts to Defense". New York Times. Retrieved April 11, 2011. 1 2 3 4 5 6 7 8 9 10 11 12 13 14 15 16 17 "Draft Facts". Milwaukee Journal Sentinel. April 27, 2003. Retrieved April 11, 2011. 1 2 3 4 5 6 7 8 9 10 11 12 13 14 15 16 17 18 19 20 21 22 23 24 25 26 27 28 29 30 31 "Draft Trades (Day 2)". Milwaukee Journal Sentinel. April 28, 2003. Retrieved April 13, 2011. ↑ "Jets trade two picks to Bears for fourth overall". USA Today from AP. April 25, 2003. Retrieved April 11, 2011. ↑ "Coles goes to Redskins after Jets fail to match offer". Philadelphia Daily News. March 20, 2003. Retrieved April 11, 2011. ↑ "Bills acquire QB Bledsoe from Patriots". Sports Illustrated. April 21, 2002. Retrieved April 11, 2011. ↑ "Saints trade RB Williams". Record-Journal. March 9, 2002. Retrieved April 11, 2011. ↑ Hack, Damon (March 8, 2003). "Bills Trade Price and Make Offer to the Bengals' Spikes". New York Times. Retrieved April 11, 2011. ↑ "Gruden agrees to five-year deal with Bucs". ESPN. Retrieved April 11, 2011. 1 2 3 "Bird ship Harris to Packers". Reading Eagle. March 1, 2003. Retrieved April 12, 2011. 1 2 3 4 Felger, Michael (April 13, 2003). "Pats win 'Skins game". Boston Herald. Retrieved April 12, 2011. 1 2 3 4 5 6 7 8 9 10 11 Villioti, Tony. "Trade Index" (PDF). DraftMetrics.com. Retrieved April 13, 2011. ↑ "The Saints Trade Roaf to the Chiefs". New York Times. March 27, 2002. Retrieved April 12, 2011. ↑ "Turley shipped to Rams for second-rounder". USA Today from AP. March 21, 2003. Retrieved April 12, 2011. 1 2 Banks, Don (April 14, 2003). "Saints acquire franchise safety Jones". Sports Illustrated. Retrieved April 12, 2011. ↑ Banks, Don (April 25, 2003). "Pick-heavy Pats ship third-rounder to Fins for 2004 choice". Sports Illustrated. Retrieved April 12, 2011. ↑ "Dolphins dump Gardener, pick up Williams". USA Today from AP. August 19, 2002. Retrieved April 13, 2011. ↑ "Packers agree to terms on acquisition of WR Terry Glenn". Patriots.com. March 8, 2002. Archived from the original on May 19, 2011. Retrieved April 13, 2011. ↑ "Browns trade Colinet Back to Minnesota". Toledo Blade from AP. October 17, 2001. Retrieved April 13, 2011. ↑ "Redskins get Stai from Detroit". UPI. August 23, 2002. Retrieved April 13, 2011. ↑ Richards, Joey (March 7, 2003). 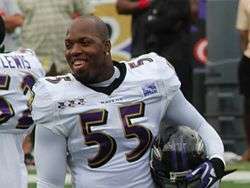 "Texans trade for 1996 La Marque grad Randall". The Galveston County Daily News. Retrieved April 12, 2011. ↑ "Briefly in sports". The Topeka Capital-Journal. March 12, 2003. Retrieved April 12, 2011. ↑ Tucker, Doug (April 20, 2002). "Chiefs Trade Up for UNC Defensive Tackle Ryan Sims". UNC (website) from AP. Retrieved April 14, 2011. ↑ "Transactions". New York Times. March 14, 2003. Retrieved April 14, 2011. ↑ "Bears Deal McNown To the Dolphins". New York Times. August 23, 2001. Retrieved April 14, 2011. ↑ "Eagles acquire ex-Cat Simoneau". The Topeka Capital-Journal from AP. March 5, 2003. Retrieved April 14, 2011. ↑ "Seahawks trade Charlton to Jaguars". Seattle Post-Intelligencer. June 21, 2002. Retrieved April 14, 2011. ↑ "Transaction". New York Times. August 20, 2002. Retrieved April 14, 2011. ↑ "Dolphins make moves". Scout.com. April 25, 2003. Retrieved April 14, 2011. ↑ Johnson, Troy (August 23, 2003). "Redskins trade Rosenfels to Dolphins". Telegraph Herald. Retrieved April 14, 2011. ↑ "Jaguars and Smith Agree to Terms". New York Times. September 1, 2002. Retrieved April 14, 2011. ↑ "Cowboys | Garmon Traded". KFFL.com. October 12, 2002. Archived from the original on November 3, 2011. Retrieved November 3, 2011. ↑ "Saints release veteran RB Allen". CNNSI.com. September 1, 2002. Retrieved April 14, 2011. ↑ "Dolphins Trade Cornell Green To Tampa Bay". Miami Dolphins (official site). August 20, 2002. Retrieved April 14, 2011. ↑ "NFL Draft: Overview". ESPN. April 11, 2011. Retrieved April 15, 2011. ↑ "Facts and figures on the 2003 NFL Draft". NFL. Archived from the original on November 13, 2006. Retrieved November 26, 2006. ↑ "NFL Draft Compensatory Picks List". Sports Illustrated. March 25, 2003. Retrieved April 15, 2011. ↑ "Fact & Figures on 2003 NFL Draft". National Football League. April 16, 2003. Archived from the original on October 29, 2013. Retrieved October 29, 2013. 1 2 "Minnesota Passes In NFL Draft". CBSNews.com. April 26, 2003. Retrieved April 15, 2011. ↑ Hack, Damon (April 28, 2003). "High-Speed Precision On Draft's 2nd Day". New York Times. Retrieved April 15, 2011. 1 2 "Hurricanes, Nittany Lions dominate first round". Sports Illustrated. April 26, 2006. Retrieved April 15, 2011. ↑ "McGahee arrives in Buffalo". NFL. May 1, 2003. Archived from the original on September 8, 2006. Retrieved November 26, 2006. ↑ "Roundup". The Gainesville Sun. October 3, 2002. Retrieved April 13, 2011. ↑ "Kent State to Retire Antonio Gates' No. 44 on Saturday". Kent State University (website). February 24, 2010. Archived from the original on July 19, 2011. Retrieved April 14, 2011.